Many people give their time, talent, voice and resources to help strengthen the PAESTA community. It is our membership, along with supporting individuals and organizations, that play key roles in assisting PAESTA with its mission and vision. Through these collective efforts, we make a difference in Earth and space science education for teachers and classrooms in Pennsylvania and beyond. Those that volunteer with PAESTA are most likely not aware of how their efforts transform our organization. And certainly volunteers do not serve PAESTA to seek recognition, but we hope that by our organization giving this recognition, this individual's example can encourage others to get involved and take action. This award is not an annual award. Former and current members of PAESTA’s Executive Committee may designate a recipient based upon outstanding service to the organization above-and-beyond expectations. Awardees can be individuals or organizations for a significant one-time or sustained contribution to PAESTA. 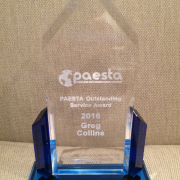 This is the first time that PAESTA has presented this award, and this PAESTA member certainly deserves to have his name in front of the membership, instead of being hidden behind-the-scenes for his hours of contributions over the years. In fact, this member began volunteering with PAESTA in February 2013, and since that time, every month, he has assisted in writing and reviewing our electronic organizational newsletter News and Notes (if you are keeping track, that is over 40 issues that have been shaped by his editorial hands). In addition to his volunteer duties in serving as the assistant editor for News and Notes, he has contributed images to our Earth Science Image collection, added material to the PAESTA Classroom, presented at the 2013 PAESTA Conference, and the list goes on. 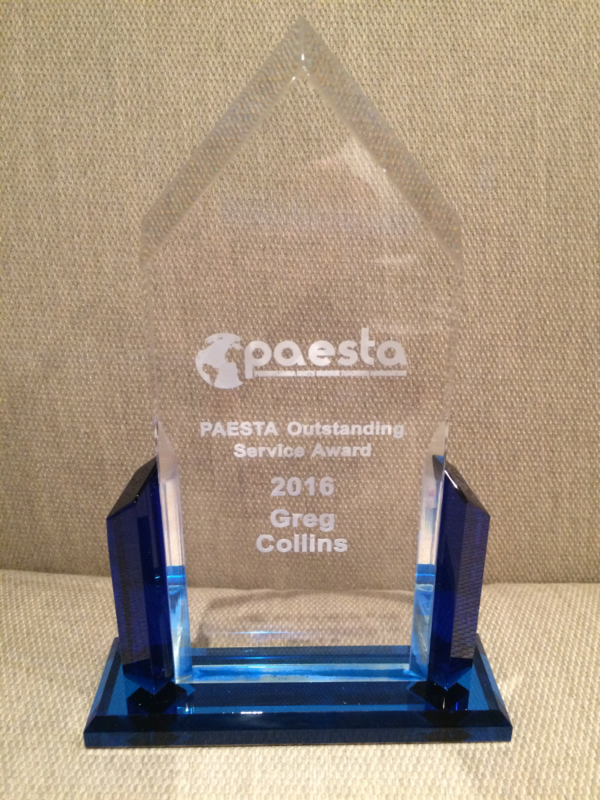 We at PAESTA value his tireless efforts, thoughtful suggestions, hard work, and dedication for not only helping lay the foundation of one of our most valuable member services, but continuing to move PAESTA towards the future. Please join me in congratulating Gregory Collins.